As far as we can tell, this is the Lache World Record. It’s definitely an Australian Ninja Warrior Record. 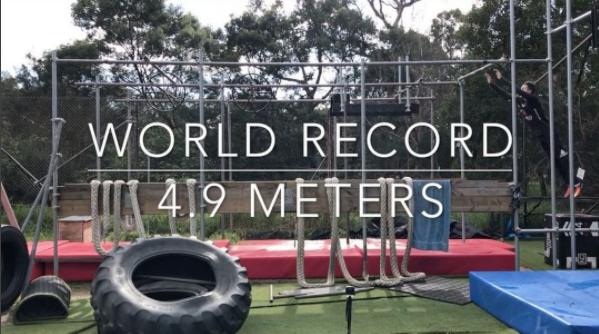 The Guinness Book of records has the current record at 3.5 metres (11ft 5.8 inches) (see here) which is really just a technicality considering Drew Drechsel and Najee Richardson battled it out to 15 ft on the American Ninja Warrior special. Although Najee is close (see here) he hasn’t hit 4.9 metres as far as we can tell. It’ll take Jaze 12 weeks to go through the Guiness Book of World Records process… but I don’t think he’ll have any problem repeating this. Exciting times!! We’re hoping to have an interview with Jaze soon. That was sick! Congrats Jaze! World Record holder. ← Ninjas In Training : Disco Ninja and Modern Mogley! → AusNW is on tonight at 7pm! See these new obstacles!